In February 2018 compared with January 2018, production in the construction sector decreased by 0.5% in the euro area (EA19) and by 0.8% in the EU28, according to a recent publication by Eurostat, the statistical office of the European Union. Activities in the construction sector is decreasing at a slower pace than in the previous month, January 2018, when production in construction fell by 0.8% in the euro area and by 1.1% in the EU28. Year over year, February 2018 compared with February 2017, production in construction increased by 0.4% in the euro area and decreased by 0.1% in the EU28. The decrease of 0.5% in production in construction in the euro area for February 2018, compared with January 2018, was due to civil engineering falling by 1.7%, while building construction rose 0.1%. In the EU28, the decrease of 0.8% is due to civil engineering falling by 2.7% and building construction by 0.2%. For the trailing twelve months to February 2018, the increase of 0.4% in production in construction in the euro area was attributed to building construction rising by 1.7%, while civil engineering fell by 4.6%. In the EU28, the decrease of 0.1% was linked to a 3.8% decline in civil engineering, while building construction grew by 0.6%. 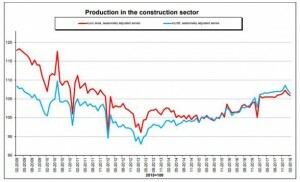 Year over year, Poland (+31.3%), Hungary (+26.1%) and Romania (+10.6%) were the highest increase in production in construction . The largest decreases for the year were observed in Belgium (-5.3%), the United Kingdom (-3.9%) and France (-3.0%).